2 About that time Emperor Augustus gave orders for the names of all the people to be listed in record books.2 These first records were made when Quirinius was governor of Syria. 3 Everyone had to go to their own hometown to be listed.4 So Joseph had to leave Nazareth in Galilee and go to Bethlehem in Judea. Long ago Bethlehem had been King David’s hometown, and Joseph went there because he was from David’s family. 5 Mary was engaged to Joseph and travelled with him to Bethlehem. She was soon going to have a baby, 6 and while they were there, 7 she gave birth to her first-born son. 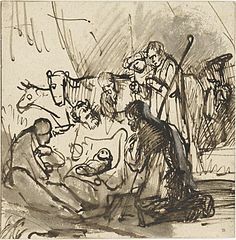 She dressed him in baby clothes and laid him on a bed of hay, because there was no room for them in the inn. Martha’s story reminds me that the coming of Jesus disturbed lives. People who thought their lives were sorted, going along nicely; those who thought their lives were full already. People whose lives were just going along – and then Jesus burst into them – and nothing was ever quite the same again. People open their hearts and lives to God. And he comes. Changes priorities, opportunities presented, new life born, hope re-kindled.